Happy Christmas Eve! I'm sure everyone has a jar of mincemeat hanging around the house at the moment. It's prime mince pie season. If you happen to have some left over, I encourage you to make these truffles! If you don't, I insist that you go out and buy a jar solely for this recipe! Inside the chocolate coating is a luscious, dense chocolate truffle spiked with the flavours of Christmas. Every here and there you get some texture from the mincemeat-a raisin, some mixed peel, a nut. They are two mouthfuls (or one!) and bursting with flavour. The chocolate and mincemeat blend together to create the best Christmas treat. Decorated like a little plum pudding-you're gonna wanna bag these up and share them with your friends! Show them off! Hello! Hello! Christmas is just around the corner. The time of year for relaxing and spending time with family and friends. Looking back on years gone by and looking forward to what's to come. And the inevitable giving up on your New Years resolutions! Although, my new years resolution is to read 24 book in 2019. Two a month. I am hoping to really keep to it. If you have any good book recommendations, let me hear them! 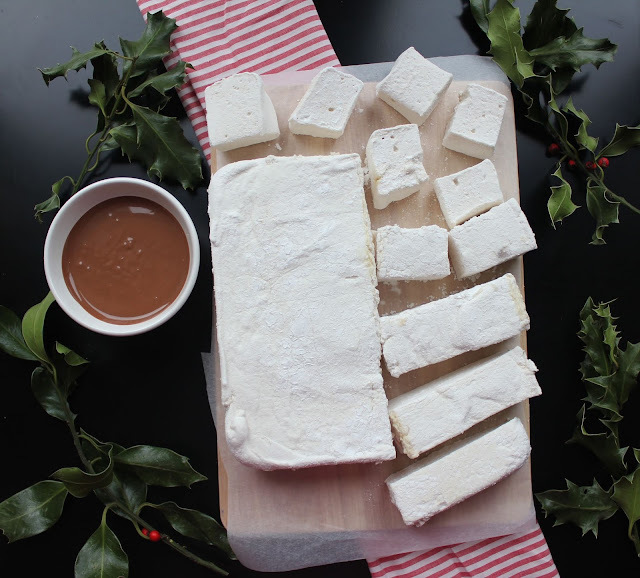 Whatever way you spend your Christmas, these festive marshmallows are sure to go along with whatever you're doing! They are flavoured with vanilla, cinnamon, ginger and mixed spice. The number one Christmas spices! I swear to you, these will be the best marshmallows you taste. The texture is absolutely perfect. They are thick and pillowing with just the right amount of chew to them. If that doesn't win you over, they're dipped in chocolate too. I mean, come on!!! There is nothing new about this recipe. There are several versions of it all over the internet and in cook books. Pea and mint soup, pea, mint and feta salad, minty mushy peas, the list goes on and on. So why am I bothering to blog it? Because peas, in any style, are my all time favourite thing and I think I've said this in a previous blog post- I always have a bag of frozen peas in my freezer. In this case, they are with fresh mint, the star of the show. Five ingredients and twenty minutes of your time and you will have this soup on the table. Well, eight ingredients if you include the olive oil, salt and pepper! Chances are you have the ingredients already in your house. Some light chopping and the soup is basically done.